‘Tell everyone: don’t work in this industry’. That’s the first thing Yar Choon Phiow said when I told him I was writing a story about the life of a hawker. It’s not a glamorous job: the hours are long, the work is physically exhausting and dealing with difficult customers can be mentally draining. Yet, the 72-year-old has been selling fish soup for more than 40 years with the help of his wife, Madam Yar, 63, and younger brother, Choon Niong, 60. 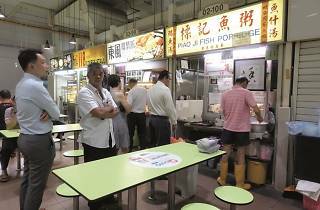 The trio runs Piao Ji Fish Porridge at Amoy Street Food Centre that specialises in fish soup. You know, the one on the second floor with two stalls located across each other that have unending queues during lunchtime. This is how they make the magic happen. The day before, I asked Mdm Yar (who doesn’t want her full name published) what time I should start the day with them. She told me 7am. But perhaps that was out of pity, because when I arrive, things are already in full swing: Mdm Yar is chopping veggies while the brothers work on the seafood. I ask what time they got there and they reply, ‘Around four in the morning.’ They work so systematically that scarcely a word passes through their lips – only songs that play on the stall’s radio fill the air. Choon Niong starts on the soup, throwing in fish bones into the stock. ‘It’s not easy, you know, this life,’ he sighs. It’s been about three hours since I’ve been here and none of them have taken a break to sit, let alone eat. 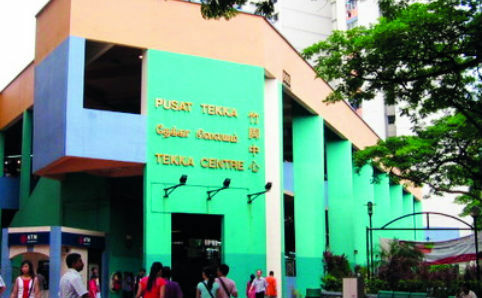 Meanwhile, CBD folks are now starting to stream into the hawker centre to tapow their breakfast to the office. A man in his 70s appears and waves hello to the siblings. He sits at the table closest to the stall and starts reading the morning paper. About 50 minutes later, the signboard lights up and Choon Niong begins taking orders. The wizened man is first in line and orders a bowl of fish head soup. He finishes it in less than ten minutes. By the time he’s done, ten others have already joined the queue. From the minute Piao Ji opens, the queue doesn’t end. By the time 12.30pm hits, there are about 20 people in line. Mdm Yar takes orders while Choon Niong scoops out rice. Choon Phiow is responsible for making each bowl of fish soup, timing how long the seafood should remain in the pot lest it overcooks. But because the stall is small, hot and cramped, it gets hard to breathe in the kitchen, so Choon Niong occasionally takes over. They sell about 100 bowls every day during lunch alone. Even as the lunch crowd dies down, a queue persists. Choon Niong has lunch at 2.30pm, chatting with regulars in between slurps of his soup. I ask him if he has fish soup every day and he laughs – I think that means yes. Despite there being a bowl of fish soup waiting for her, Mdm Yar isn’t as fortunate. ‘If we have time, we eat. If there’s no time, then we can’t eat. 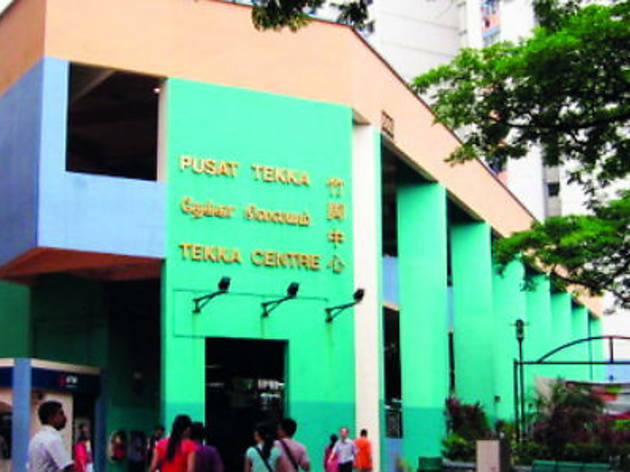 I’m very hungry now, but no choice.’ A customer must have overheard this, because five minutes later, she passes Mdm Yar a slice of min jiang kueh from a neighbouring stall. 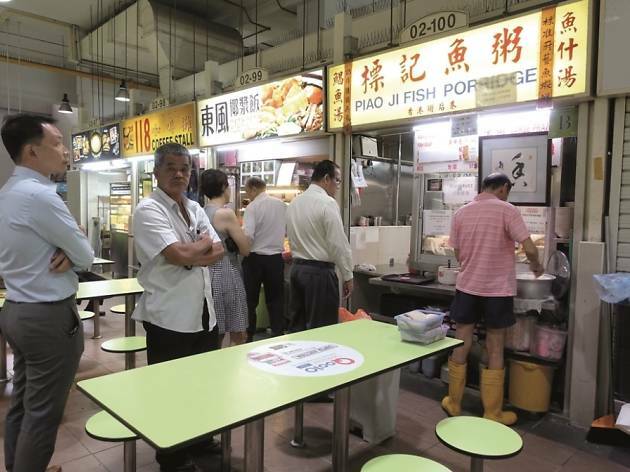 The last order is finally taken at 3.45pm, 15 minutes after Piao Ji officially closes. Mdm Yar’s fish porridge has long grown cold and the pancake from before is still untouched. Choon Phiow quickly finds a seat to rest his legs – it’s amazing how the 72-year-old still finds the energy to be on his feet all day in front of the stove. The radio comes back on as the trio start to pack up. Choon Phiow ensures finances are in order, Choon Niong scrubs down the stall, and Mdm Yar washes the bowls. The atmosphere grows more convivial as Mandopop tunes play through the clanging of pots. It’s been about 12 hours since the trio started their day. Choon Phiow’s first words ring in my mind. 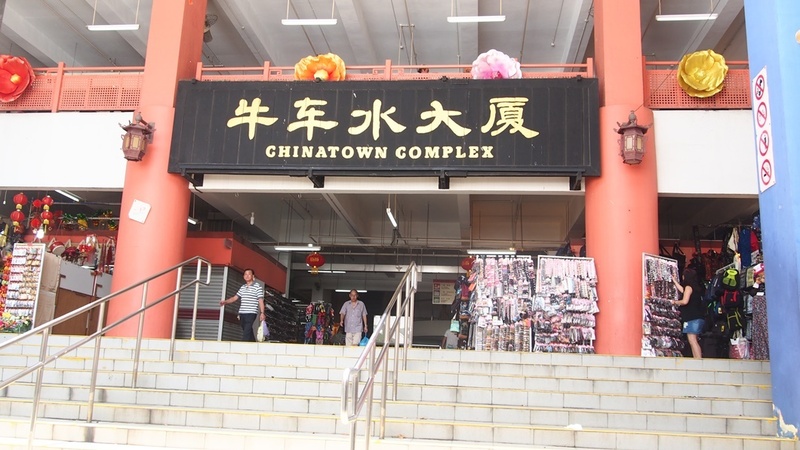 The two-storey complex is packed with bustling shops, a wet market and a food centre that serves up predominantly Indian cuisine. Besides tandoori breads or tiffin dishes, a must-try is briyani from Alauddin’s Briyani. 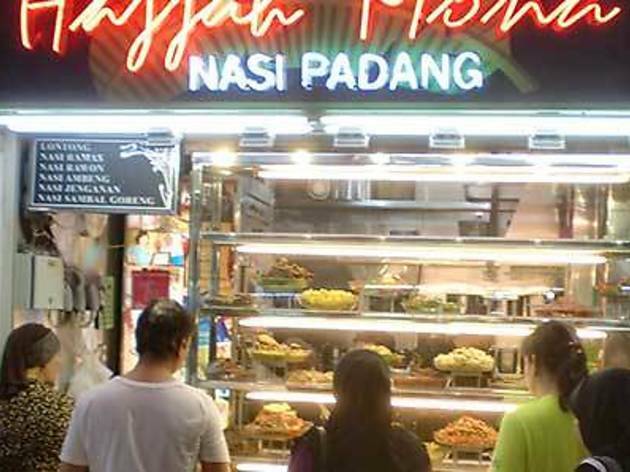 This airy 955-seater food centre pays tribute to its roots with a slew of Malay classics. 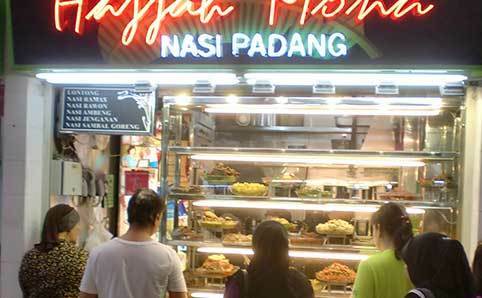 Go for the nasi padang from Hajjah Monah and banana fritters from Goreng Pisang and Kueh Mueh. 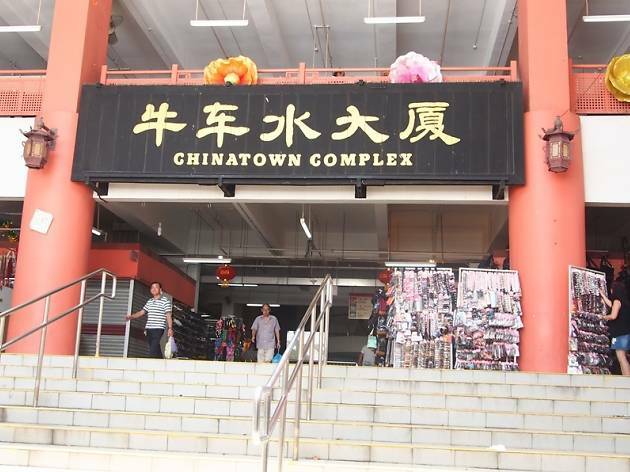 This humongous complex has over 260 stalls hawking dishes at wallet-friendly prices. Besides the one-Michelin-starred Liao Fan Hong Kong Soya Sauce Chicken Rice and Noodle, try Xiu Ji Ikan Bilis’s yong tau fu, steamed fish from Cheng Ji, and claypot rice from Zhao Ji.